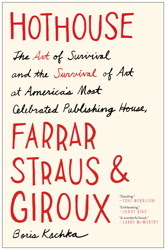 Farrar, Straus and Giroux is arguably the most influential publishing house of the modern era. Home to an unrivaled twenty-five Nobel Prize winners and generation-defining authors like T. S. Eliot, Flannery O’Connor, Susan Sontag, Tom Wolfe, Joan Didion, Philip Roth, and Jonathan Franzen, it’s a cultural institution whose importance approaches that of The New Yorker or The New York Times. But FSG is no ivory tower—the owner’s wife called the office a “sexual sewer”—and its untold story is as tumultuous and engrossing as many of the great novels it has published.